The first Catholic church in Novi Sad from the early 18th century was a modest and a rather temporary structure which was pulled down in 1742. the new church was built at exactly the same spot. 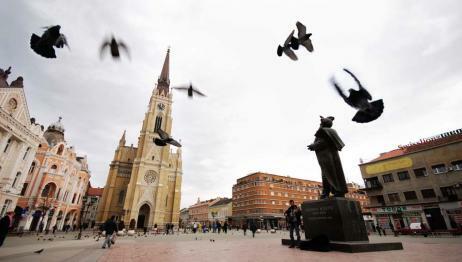 After the fall of Belgrade to Turks in 1739, many wealthy Catholics moved to Novi Sad and saw their businesses flourish, which enabled them build fast. A new church was consecrated by the Catholic Archbishop Gabor Patačić in 1742. The church has four altars in total. The main one is in the apse, together with a great painting of the Virgin and Hungarian kings St Stephen and St Ladislaus. The woodcarvings depict God, the Evangelists and several Biblical motifs. Left of the apse is the altar of the Resurrection of Jesus with St Peter and Paul wooden figurines. The third altar is consecrated to St Florian, the patron-saint of firefighters. The altar also has wooden figurines of St Emerich, St Elizabeth and The Holy Family. The fourth altar is beneath the choir and is consecrated to the Holy Sepulcher, with four angelical figurines. All the figurines are colorfully painted or in artificial stone. Beneath the choir - in the lower niche - is the bust of Georg Molnar, the main designer of the church. He worked a lot with numerous masters and artisans from Budapest, Timisoara, Tyrol and Subotica, but he preferred those from Novi Sad: master-builder Karl Lerar, mason Johan Šoman, carpenters Matijas Drah and Filip Jaus, sculptor Gustav Frajhtner, locksmith Leopold Bernold, glazier Lajoš Vurst, joiners Stefan Gusek and Karl Bek, dyers Franc Štajn and Ilijaš Vincens, thatcher Jozef Klajnček, smelter Emerik Dizgen, lightning-rod constructor Johan Huk, elctrician Franc Vic and others. The organ was installed by Gerb Riger Jagerdorf from Silesia. and the art carvings and relief were made by Ferdinand Štuflezer from Tyrol.